City dwellers, farmers and nomads, Arabs, Kurds, Armenians, Turks, Muslims, Christians and Jews - all have made their contributions to the colourful mosaic of Syria's craft traditions. Textiles and silver jewellery produced in the towns are complemented by peasant handicrafts: bold ceramics, mats woven from white straw with spirited designs. Dresses with profuse embroidery or geometric patterns display the origins of the women who wear them. Syrian nomads make brilliant carpets with which to decorate their tents and their camels. At the time of the Crusades, Damascene cloth and metalwork, and glassware from Aleppo, were much sought after in the courts of Christian princes. Even at the end of the 19th century, Syrian handicrafts were still regarded as luxury items in Europe. 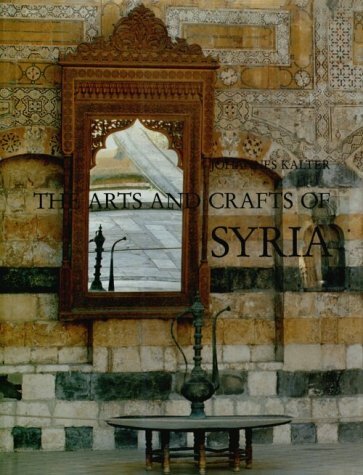 Now the whole span of this enduring culture is comprehensively treated, with explanatory text and over 600 illustrations, in an overview of Syria's material legacy. Johannes Kalter is head of the Oriental Department at the Linden-Museum, Stuttgart. Margareta Pavaloi, also based there, is an expert on ethnology and Islam. Maria Zermickel, art historian, manages the Department of Records.